exposed between 1993 and 1998. 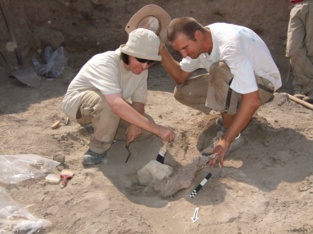 The investigated area of the 2008 season is 14 m (N/S) by 10 m (E/W) in size and comprises Trenches XLVIA-D and XLVIIA-B. 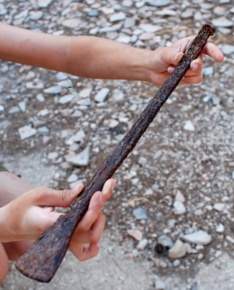 We discovered a structure from the most recent Iron Age occupation at the site which is different from the 4-room-houses. 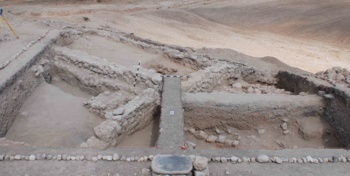 It comprises at least two rooms to the westwhich are larger than the rooms of a standard 4-room-house of Tell Abu al-Kharaz. 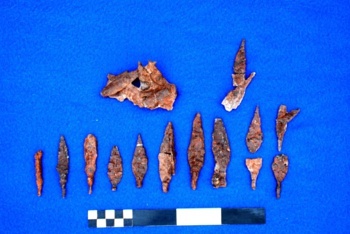 To the east is another, smaller room, and to the south of it is a workshop for the production of iron objects: numerous arrowheads and other objects of mainly iron but also bronze derive from there. 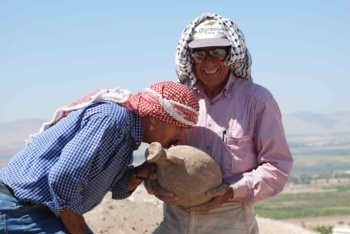 This phase was destroyed – maybe in connection with the Assyrian invasions headed by Shalmaneser III (853 BCE) or by Tiglath-Piliser (732 BCE). 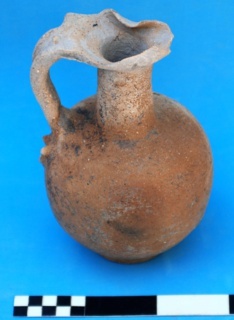 The Phoenician-imported juglet may point to a date in the 9th century (pers. communication Paco Nunez, Tyros, Lebanon; or it may be a “survivor”). Radiocarbon dates are forthcoming. We reached another phase but were not able to expose it entirely because of lack of time. 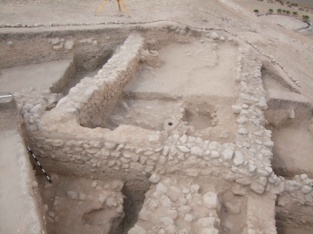 The three rooms contained much pottery and other finds some of which are imports. There is firm evidence of textileproduction in this area because of the presence of numerous loom weights of mainly sun-dried(unfired) clay. 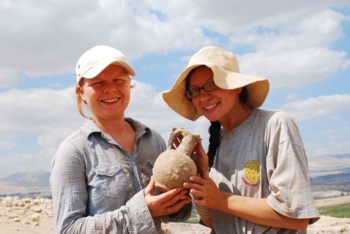 Other finds include earthenware objects for daily use, tools of bone, metal and stone, and jewellery. 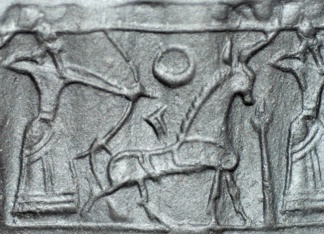 Imports include a Phoenician juglet and a Neo-Assyrian cylinder seal. 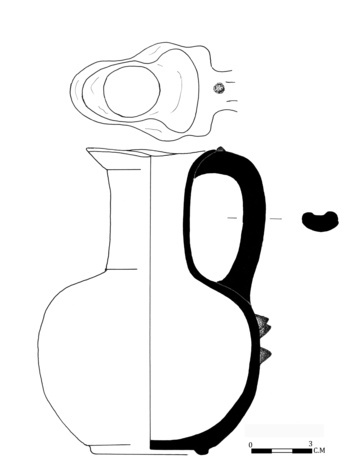 From 2008, the find of another ostrakon (cf. 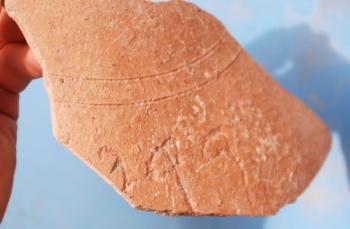 season 1996, “White Building”), an incised sherd of a storage jar, should be mentioned. It depicts the letters (from right ot left): “r”, “q” and then most likley “y”. 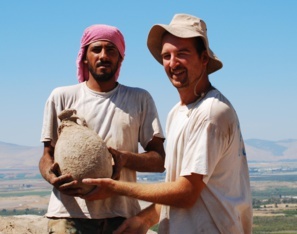 It might be a personal name, or it is related to the contents of the storage vessel. 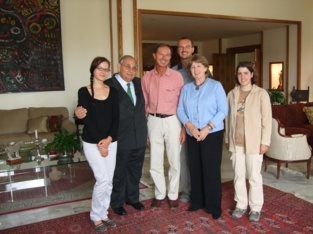 ... and a very nice visit in the lovely home of our supporters since 1989, TRH Prince Raad and Princess Majda!